Photo courtesy of Matt Waite. Today’s journalism and media students may produce all kinds of projects. They might code websites, develop multimedia, build devices and contribute to a huge range of collaborative efforts that require both new ways of thinking and innovative ways of working within schools’ physical spaces. I recently talked with faculty at four institutions who are creating “maker spaces” or “hacker spaces” that provide room for this innovation. Their examples show that maker spaces can be created in settings big and small with a range of levels of investment. All of these efforts show students the importance of thinking innovatively not only about journalism and media, but also about the larger purposes of their education. "Implementing maker spaces in journalism and media programs, and then facilitating interdisciplinary exploration and collaboration within them, reflects a new model of education that requires adaptation by everyone involved." Tom Haymes, director of college educational technology services and professor of government at Houston Community College Northwest (whose presentation on “idea spaces” at the New Media Consortium conference last month inspired this story). From left to right: Littau, Coester, Waite and Haymes. Whether you have millions of dollars for a new building or just have an available classroom, there’s probably a way to create a useful maker space. Coester and Haymes are both involved in the design and construction of dedicated maker spaces in new buildings at their respective institutions. Coester is currently acting creative director of the new 10,000-square-foot Media Innovation Center at WVU, which will open next year. (She recently wrote about this project for EducationShift.) After visiting many creative workspaces around the country, including Facebook and Google offices, the WVU team designed a variety of spaces in the new building to support many different kinds of media and technology projects. There will be a maker space, a hacker space (“device lab”), an “incubator” communal area for collaboration, a digital storytelling lab, and a multimedia/augmented reality studio. Haymes is involved in the design of the West Houston Institute, scheduled to open in summer 2016, that will include collaborative workspaces for faculty, students and community members, along with active learning classrooms, a media commons with support for media production and a learning commons area for research and technology work. “The campus is designed around those spaces. They’re not just an add-on, not stuck in a building in East Siberia,” Haymes said. 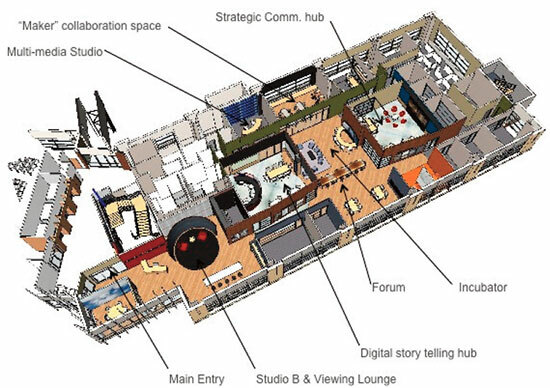 The layout of the new Media Innovation Center at West Virginia University. Waite and Littau, however, have both creatively co-opted existing facilities at their institutions to create maker spaces. While Waite’s university is now planning a 17,000-square-foot maker space at its Nebraska Innovation Campus, Waite was already ahead of the curve. In fall 2011, he created his own maker space to support his interest in drone journalism, but also for use by all journalism students. Waite repurposed part of a rarely used still photography studio as a maker space. The room had become “the garbage disposal of the building,” filled with spare furniture and junk, Waite said, but he’s now outfitted it with large workbenches and storage space for tools and parts. He and another faculty member offer “maker hours” on Friday afternoons for all interested students. Even a humble computer lab can become a maker space for diverse projects, if approached creatively. 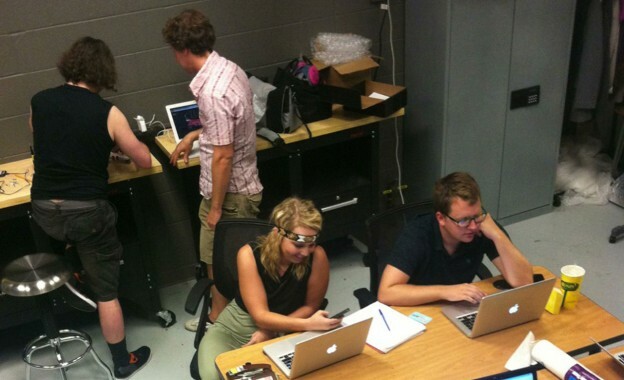 Wanting to offer students time and space to experiment with new skills, Littau claimed a computer lab for use as a maker space during two pilot “maker hours” sessions in spring 2014. While it’s used by the student newspaper and for some class meetings, Friday afternoons now see the room reimagined as a collaborative maker space. Like Waite, Littau hosts these sessions and offers support to any students who want to pursue a new skill. “It’s an ‘unclass’ kind of format. If you want to expand your skills outside of the classroom and learn something new in journalism, you don’t have classes on Friday, and you want to come learn and get the most of your education, we’ll be here,” Littau said. This variety of approaches shows that a maker space is as much about participants’ attitudes as it is about the physical setting. Cool stuff can be created in a large dedicated lab with a lot of special equipment or in a basic but innovatively used room. Getting students involved in these kinds of open-ended maker spaces is a different challenge. Students can be very focused on their coursework and grades and aren’t always open to pursuing “more work” on their own time outside of scheduled classes. Yet less structured projects that reflect students’ own passions offer great opportunities to experiment with new technologies, solve problems creatively and collaborate with students and faculty from different fields. Students also learn how to teach themselves new skills. While this sounds like a terrific opportunity for students and faculty to learn together, both Littau and Waite have observed some reluctance among journalism students to try out these new skills. When students have been focused on producing text for most of their academic careers, it can be difficult to leave that comfort zone. While larger academic programs offer dedicated technology classes to stretch students’ creativity, Littau — whose department has just six full-time faculty — emphasized the utility of maker spaces and maker hours for smaller programs. 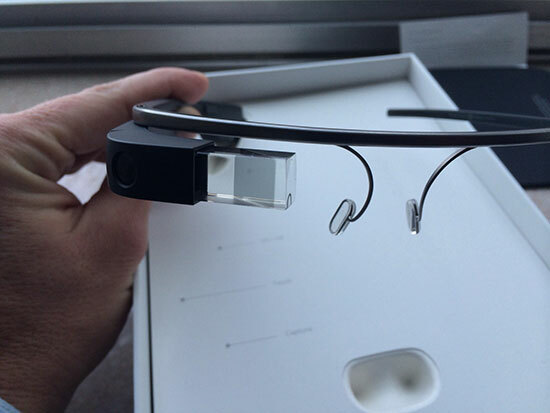 Google Glass: one of the experimental items in Waite’s maker space. When students have a chance to make something new, they usually rise to the challenge, sometimes in unexpected ways. Waite says he will “haze” students on their first visit to maker hours and require them to work on something physical, which he then documents with a photo on his website. This has had what he calls a “delightful,” unexpected result. The Houston and WVU maker spaces will extend those possibilities to community members as well. Getting students and community members involved is one challenge. Convincing other faculty and higher education administrators of the value of these spaces can be another. While “maker culture” has become more mainstream, it can still be difficult to explain the need for this approach and complementary physical spaces to colleagues and leaders. Coester’s program recently went through a rebranding that highlighted both its innovations and the increasing variety of projects that it might include as a “college of media.” That new vision provides some structural support for a “maker” approach to teaching. Implementing maker spaces in journalism and media programs, and then facilitating interdisciplinary exploration and collaboration within them, reflects a new model of education that requires adaptation by everyone involved. Haymes describes this shift from an “industrial” model of education, in which student knowledge was the “product,” to a new model in which skills and higher-level thinking are key — and that generates more meaningful learning. Susan Currie Sivek, Ph.D., is an assistant professor in the Department of Mass Communication at Linfield College. She teaches media theory, writing and editing, and does research on magazines, social media and political communication. Echoes of the Media Innovation Studio at the University of Central Lancashire, UK, and lots more besides – including the term ‘maker spaces’ and the Friday afternoon ‘unclasses’.